Will QC’s online design courses give you the training and certification you need to become a design professional? Explore some frequently asked questions below and learn how QC Design School equips you with the skills you need to launch your career! Is it possible to learn home design online? Absolutely! As a QC student, you’ll receive the tools you need to develop your skills and knowledge in the design industry. You’ll succeed through hands-on assignments, and you’ll learn professional skills for real-world scenarios. QC Design School allows you to work through assignments entirely at your own pace. There are no deadlines or stressful time restrictions. Online design courses will fit into your own schedule and lifestyle. Even though you’re learning from home, this doesn’t mean you’re learning alone—you’ll be matched with a personal tutor who is a working professional in the design industry! Your tutor will guide you through the class and provide detailed feedback on your work. You’ll build on your knowledge as you move on to further units. QC Design School’s Student Support Specialists are always available to answer your questions before, during and after your design course! Contact QC today. Does the tuition cover all costs of QC’s design courses? No matter which program you choose, your design school tuition covers the cost of course texts, reference books, art supplies, DVDs, and access to the Online Student Center. As part of your QC Design School course fees, you’ll also receive personal advice from your tutor who is a working professional in the design industry. Do I need prior training or experience as a home designer before taking QC’s online course? No, you do not need any previous experience in the design industry to succeed in QC’s design courses! Whatever career path you choose, QC’s courses will teach you everything you need to know, from the fundamentals to advanced techniques, in order to become a qualified design professional. How long will it take to complete my online design classes? With QC Design School’s online courses, you work entirely at your own pace, and decide how much time per week you want to spend developing your skills. QC’s flexible design training has no deadlines for completing course assignments. You can work through your assignments as quickly or slowly as you like! Typically, students who work on their assignments for a short period each week will complete their design course within four to six months. Keep in mind that you have two full years to complete your design course, so you can schedule your online design training around your lifestyle! What if I decide QC’s design course is not right for me? Once you receive your design course materials, you have 21 days to decide if you would like to continue with your online design training. If, for any reason, you decide that the course isn’t for you, simply contact QC Design School for a refund of your tuition. QC will provide shipping instructions for you to return your unused design materials. Please note that return shipping fees are not covered by the school. Is QC an accredited online design school? Yes! QC Design School is accredited by the Better Business Bureau (BBB), holding the highest possible consumer rating (A+) and a positive 100% consumer ranking. QC has been in business since 1984 and has a superb track record with students and customers. If I take a QC design course, will I be able to start my own business? Yes—QC’s online design classes include complete business training. You’ll learn how to set up and promote your design services, and you’ll receive professional advice during and after your design course! Are there any technology requirements to complete my design training online? Are flexible payment plans available for each design course? Yes! QC Design School offers flexible extended monthly installment plans that will suit most budgets. Pay your tuition in monthly payments over one year. If you choose to pay your tuition on an installment plan, you’ll have the option to choose the date your payments are processed, adding another level of convenience unique to QC! Contact the Student Support Team who will be happy to help you find a payment plan that’s right for you. Do I have to pay an annual fee to QC or join an organization in order to keep my online design certification? No. Unlike other online design programs, QC Design School recognizes your right to use your professional design certificate and designation free of charge, for life. QC’s design courses are also recognized by several prominent associations, such as Professional Organizers in Canada. You’ll have the opportunity to join these associations as a student or graduate of the school. What do I do if I get stuck on a design assignment? If you have questions about your QC design course, you can contact your Student Support Team by phone, email, or Live Chat whenever you need to! The team will always be happy to answer your design questions. If they don’t have an answer for you, they’ll get one from your tutor! You can also get help and advice from your peers on the QC student forum, or from the QC Design School community on Facebook. Will I be eligible to join a professional association and/or organization upon graduation from QC Design School? Yes! Each association usually has its own application process and fees, so it is recommended that you visit the specific association’s website. You can view a short list of design associations here. How will QC help me start my design career once I’ve finished the course(s)? QC Design School hosts a variety of free career resources for students and graduates in the Online Student Center. 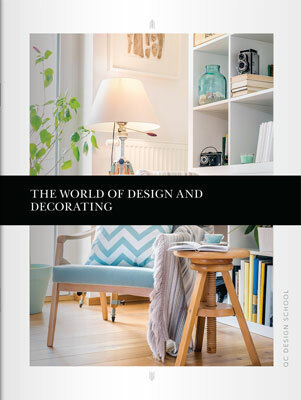 Design students also receive free online business training which prepares you to run your own home design business! Even long after you have graduated from QC’s design courses, you are always welcome to reach out to the Student Support Team who will be happy to offer ongoing support and guidance throughout your design career.